When Should My Child Have His First Dental Visit? - Adelberg Montalvan Pediatric Dental PC & Orthodontics too! When Should My Child Have His First Dental Visit? If you’re thinking you’ll wait to visit the pediatric dentist until your little one’s first full set of chompers has arrived, you’d be surprised to hear you’re terribly wrong! Studies have shown that most children don’t visit the dentist until they’re over two-years-old, but experts suggest you make that first appointment sooner rather than later. So, when is the best time to take your wee one to the dentist? The American Academy of Pediatric Dentistry (AAPD) recommends that a child goes to the dentist by age one or within six months after the first tooth erupts. What keeps parents from making a pediatric dental appointment? Well, for starters, many people don’t realize the impact that early intervention has on a child’s overall oral hygiene — both mentally and physically. 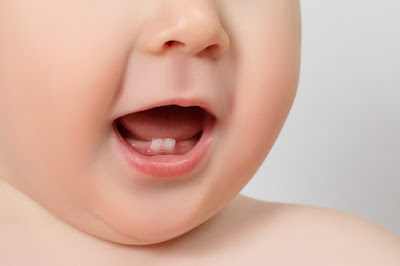 How your child’s baby teeth are cared for has a direct correlation on the formation of their adult teeth, and how they will learn to care for them. But that’s not all! Why do primary teeth matter so much? They’re going to fall out regardless, right? Sure, but having healthy primary teeth helps children learn to chew and speak properly. They also pave the way for sparkling permanent teeth and promote a healthy smile. So, what are you waiting for? If your little one is ready for their first dental cleaning and exam at Adelberg Montalvan Pediatric Dental, reach out to one of our three Long Island locations today! We offer pediatric dental services in Massapequa Park, Nesconset, and West Islip.